Now, is this not a happy scene? 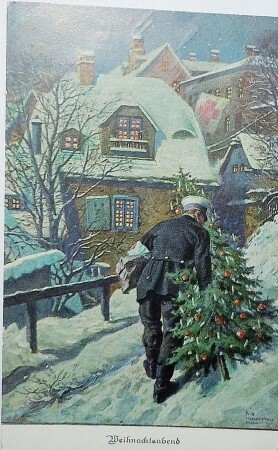 A nice Christmas Tree for the boys …….that have been blown apart in the trenches during WWI! For an even more “makes me want to puke! ” video produced in 2014 by Sansbury’s (an English food firm) trying to be politically correct 100 years later!! 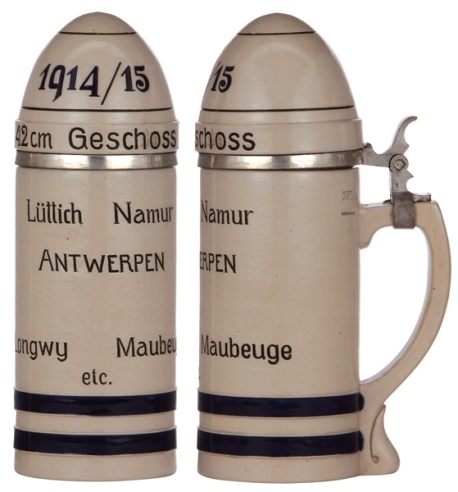 Having been in the Franco – Prussian war, just after two smaller local wars, and then engaged in two “World Wars ” the German artisans have made lots of “CHARACTER” beer steins that look like artillery shells. 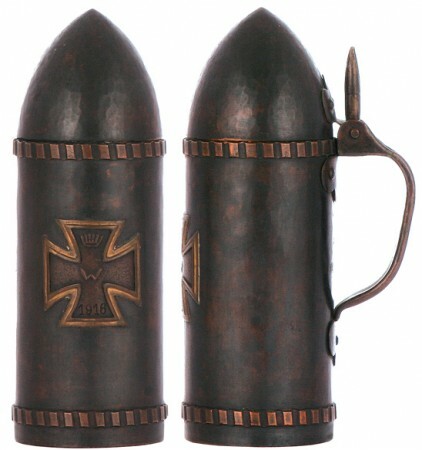 Most will carry dates that defines which war they were made in. 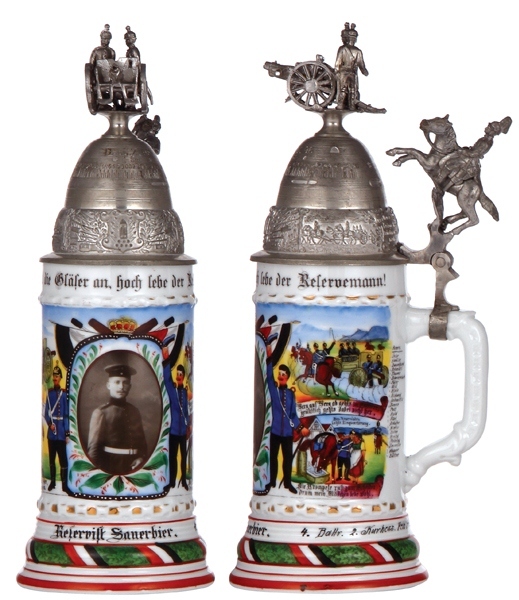 Most were from shells and were converted into hand made steins. 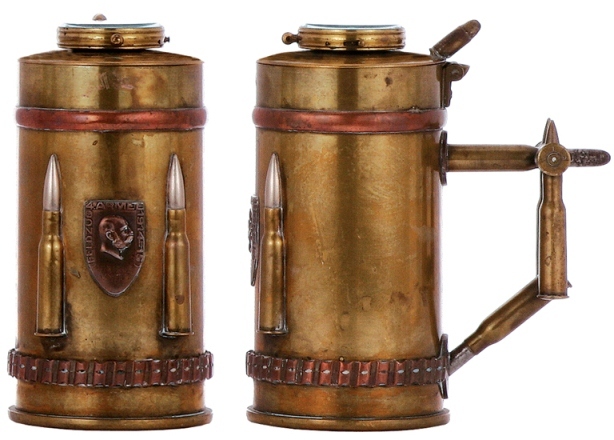 These are called “Trench Art Steins,” as shown below ▼. 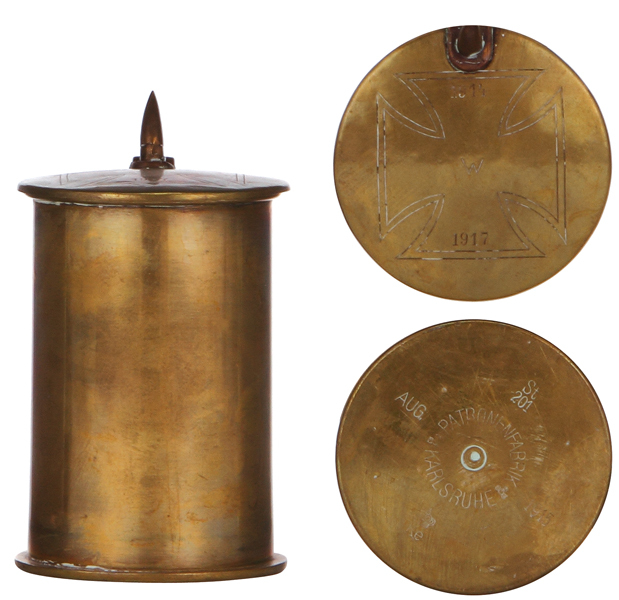 .5 Liter.Trench Art, brass & copper, Artillery Shell, Lid engraved with Iron Cross, 1914 – 1917. 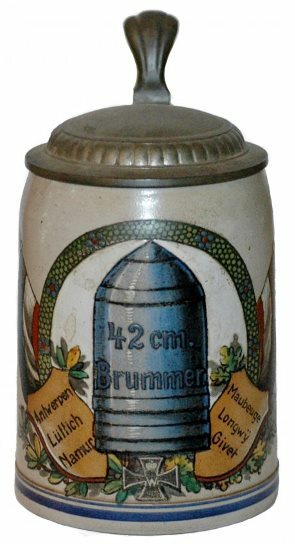 Shell – Character stein, .5L, porcelain, porcelain inlaid lid. 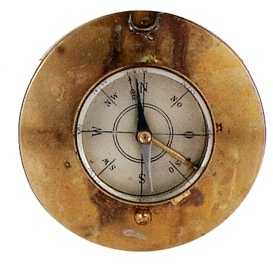 Shell – .5 liter, an all porcelain body and lid’s head is painted brass. 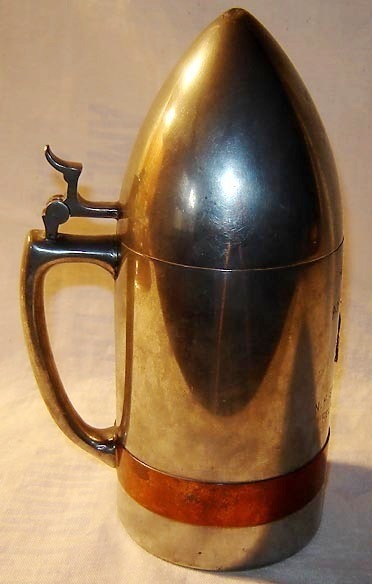 .5 liter ceramic body, with a real brass head inserted in it.. 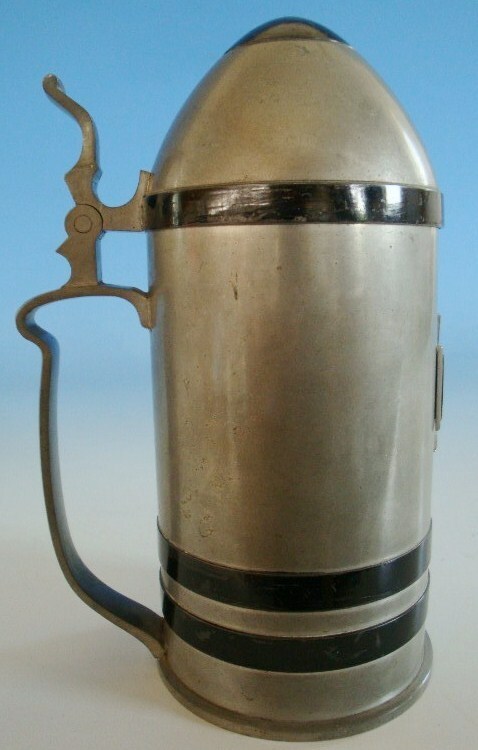 Same as above .5 liter ceramic body, but with a different lid, all pewter. 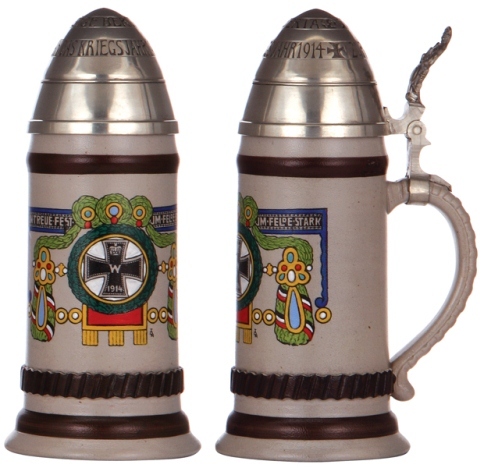 Pewter shell, same as above only with the Bavarian Coat of Arms on front. 7.5 IN. Here is a novel approach in pewter also.▲: Relief portraits of the two men mostly responsible for the 16 million deaths and 20 million wounded. Ranking that war among the deadliest conflicts in human history. American made shell. In much better condition, also by N. G. WOOD. 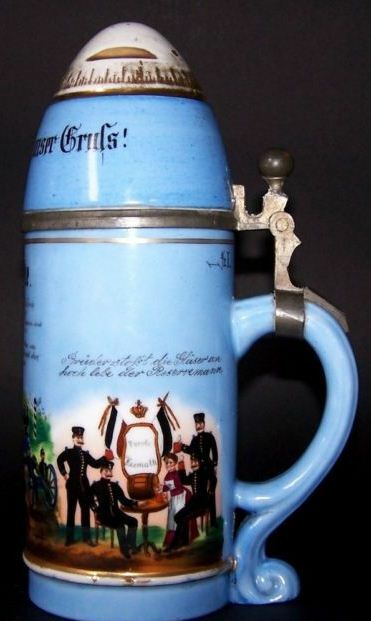 Above ▲a .5 liter Character stein in porcelain, By Bohne.Germany . One of the most scarce and expensive when found. Style No. 1, porcelain shell head with no finial; 2. Westf. Feld Artillerie Regiment 22 Münster. While not a shell character stein, this .5 liter stoneware PUG would certainly be a nice “Go-with” to a shell stein collection. Unknown maker.